German preacher and author; died at Frankfort-on-the-Main 1597. 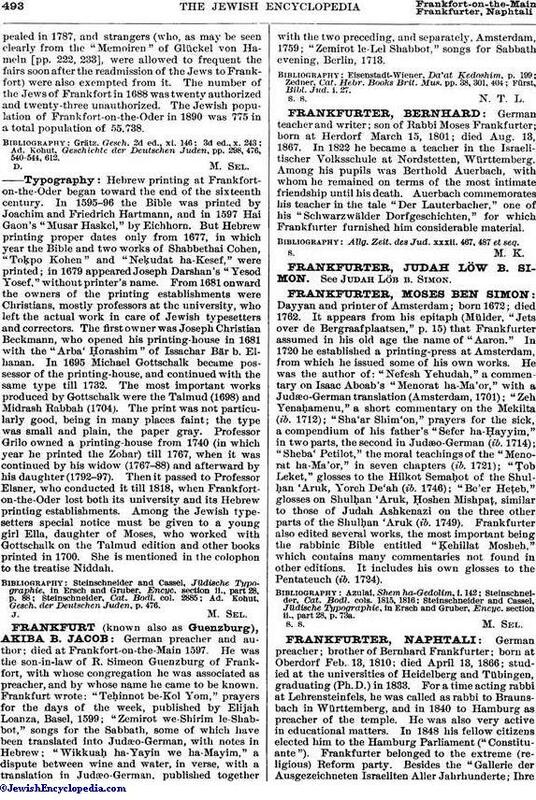 He was the son-in-law of R. Simeon Guenzburg of Frankfort, with whose congregation he was associated as preacher, and by whose name he came to be known. Frankfurt wrote: "Teḥinnot be-Kol Yom," prayers for the days of the week, published by Elijah Loanza, Basel, 1599; "Zemirot we-Shirim le-Shabbot," songs for the Sabbath, some of which have been translated into Judæo-German, with notes in Hebrew; "Wikkuaḥ ha-Yayin we ha-Mayim," a dispute between wine and water, in verse, with a translation in Judæo-German, published together with the two preceding, and separately, Amsterdam, 1759; "Zemirot le-Lel Shabbot," songs for Sabbath evening, Berlin, 1713. Fürst, Bibl. Jud. i. 27.